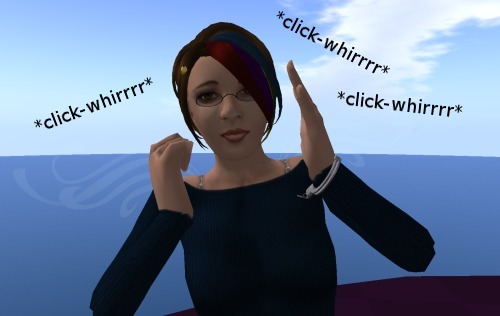 Tired of *click-whirrrr*-ing your way through Second Life? Help is here! Vote for VWR-2448 TO-DAY! This message brought to you by the Ad Council for the Egregious Use of Bolding. // Translation tool only works if mouse button is down. // Bail out if mouse not down. dialog_refresh_all();		// ??? is this necessary? This is one of those functions that makes your eyes go blurry and your head start to hurt until you curl up into fetal position and question the existence of a merciful god. At first, I didn’t think the pie-menu-edit crash affected me, but I was able to crash when I tried the repro on the PJIRA. Just reading that there was a new crash when entering edit mode was enough to make my stomach tense up with anticipated guilt. I had a Victor Frankenstein moment: what sort of monster have I created and unleashed upon the world? Fortunately, I haven’t seen anything to suggest that it’s directly related to my patch. Phew. In this version, I can walk and fly around with the edit window still open! It doesn’t close (and thus forget what I had selected) just because my avatar moves anymore! Yay! Goal: Make the “Profile Cut Begin and End” spinners visible in the Edit window while editing a Box, Cylinder, or Prism. Currently it only shows up for Torus, Tube, and Ring (and under the name “Dimple” for Sphere), but the setting does have a useful effect on Box & friends. I also wanted it to only show up when I turn on the the “AdvancedMode” preference that I added. 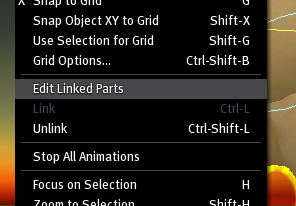 Goal: Add a keyboard toggle for the “Edit Linked Parts” checkbox in the Edit window. I’ll also probably add a menu entry for it in the Tools menu as part of that process.